Are the horns and the craftsmen the same thing? Zechariah wonders about what he sees and after seeing four horns, he asks what they were (or what they represented)? The angel he speaks to tells him simply that they are the horns that scattered Judah, Israel, and Jerusalem. We know that in the Bible, a “horn” represents power. Animals that have horns use them to gore other animals, to shred, and to destroy. The horns are not there for looks, but for the animals to use as tools. In the Bible, the four horns very likely represents all the empires, dynasties, and groups that either stood against the nation of Israel, or fought to conquer it. This would include empires like Assyria and Babylon, as well as groups like Edom. The commonality lies in the fact that either they did nothing to help Israel (as in the case of Edom by not allowing Israelites to pass through their land on the way to the Promised Land), or fought against and destroyed Israel or parts of it (as in the case of Nebuchadnezzar who conquered Jerusalem and took spoils from the Temple and people from there back to his kingdom). Nearly all commentators are in agreement that this is the case, with the horns representing powers or empires that stood against or came against Israel. The biblical text indicates that these horns took part in scattering Israel, Judah, and/or Jerusalem, spreading the people of Israel over the entire earth. The next part of the vision is where Zechariah sees the four craftsmen. Many commentators believe that because these craftsmen represent being used by God as judgment against the horns, they are seen as horns who are also craftsmen. For instance, Assyria conquered parts of the Northern Kingdom of Israel in the mid-8th century. Eventually, by 722 BC, Samaria fell to Assyria. However, what the Bible calls the Times of the Gentiles did not actually begin until Nebuchadnezzar’s Babylonian Kingdom. Some argue that Babylon defeated and replaced Assyria. Continuing on, they argue that the Medo-Persian Empire conquered and replaced Babylon. In this way, Medo-Persia was a horn, but also served as a craftsman, conquering Babylon. Greece came next, conquering Medo-Persian rule, etc. I looked into many commentaries and consistently found that most authors believe this to be the case. But, it simply did not seem right to me. The horns and the craftsmen seem to be completely separate and distinct entities. 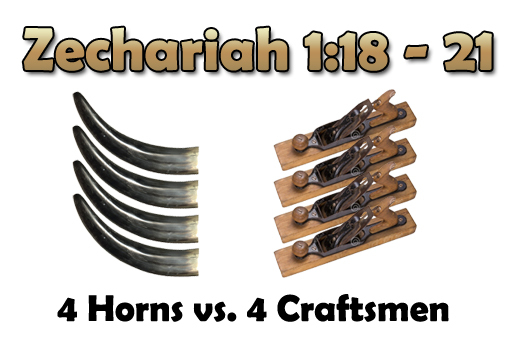 There does not seem to be an indication from Scripture that a horn is also a craftsmen. In fact, the very meaning of horn and craftsmen is different. A horn wields power that is used to conquer. A craftsman is called upon because of his talent and uses that talent to build something. We think of the craftsmen that God imbued with power to build the items for the Tabernacle or Temple. These men were not warriors. They were craftsmen and that was their God-given job. If that is the case, then who can these craftsmen be? I believe that in keeping with one of the themes of Scripture (that God uses the weak to destroy the strong), the craftsmen are men gifted with a purpose that does not involve military strength, but does overcome the ability of those empires that conquered Israel. For instance, In Ezra 3:7, we note that 17 years before Zechariah was called of God, the Temple was being restored. Nehemiah’s job had been to restore the wall surrounding Jerusalem. What is the worst thing an enemy can see happening after they conquer a people and their land? It’s when the people start rebuilding things the way they were before being destroyed. This is what strikes terror into the hearts of the horns (v. 21 of Zechariah 1). When the enemy sees that the area of destruction they have left is now being rebuilt, that would terrify them. Part of conquering another group of people is to instill within them tremendous fear. When that conquered people begin rebuilding what had been destroyed, it shows the enemy that they do not fear them. In Zechariah 1:16, God says He will rebuild His house and He began doing just that years before Zechariah was called. Note the use of the measuring line in verse 16. An engineer uses that before laying a foundation. The four craftsmen come to rebuild what the horns have destroyed. Ultimately, these craftsmen are used by God to bring His rule to the world as well as His judgment. Just as Noah built the Ark, the very act of building that Ark brought God’s rule into the world and also provided a warning, which ultimately became judgment. Moses did the same thing when God created the nation of Israel and called upon Moses to lead them from Egypt (the kingdom of darkness) to the Promised Land (Kingdom of Light). It is the same with us as Christians. As we live our lives for Christ, God’s rule is brought to bear on this world. His judgment also comes because as we live the Gospel and preach the Gospel, God’s spiritual kingdom grows with more and more people receiving salvation. We must never forget that the while we should be involved in doing things that make people’s live easier (feeding the hungry, clothing the naked, etc. ), the greatest gift that anyone can receive is salvation. We must never allow the Gospel to take a back seat to anything. We are His craftsmen on this earth to stand against the powers that stand against God’s purposes. We do not have power in and of ourselves. We are not military commanders with tremendous weapons. We are Christians. God states without equivocation in Zechariah 4:6 that His will is accomplished not by might, not by power, but by His Spirit. That is the lesson of Zechariah 1:18-21. He is the One who stands against the powers of darkness and He does it in and through us, if we will but allow Him. Entry filed under: Religious - Christian - End Times, Religious - Christian - Prophecy.